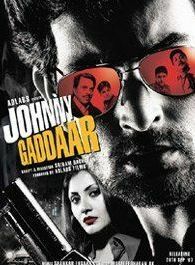 Johnny Gaddaar is a 2007 Indian crime thriller neo-noir film by Sriram Raghavan; produced under the banner Adlabs Films Ltd . It stars Neil Mukesh, the grandson of legendary singer Mukesh and son of singer Nitin Mukesh in his film debut alongside Dharmendra, Zakir Hussain, Rimi Sen, Vinay Pathak and Ashwini Khalsekar. The film has been hailed widely as a path breaking film in the Hindi movie industry. It pays tribute to film noir and the James Hadley Chase stories. 'Wazir' named after Neil Nitin Mukesh's character!